Our clients rest easy knowing we're helping to protect and grow their legacies. Calfee serves individuals and families in several capacities, including Estate and Succession Planning, Wealth Management, and Entrepreneurs/Start-ups, to name a few. As a firm built on a solid foundation of providing innovative solutions to business owners, Calfee remains keenly aware of the challenges faced by the families and individuals behind those businesses. The “full service” nature of Calfee affords you the unique ability to integrate a complete suite of legal services to manage the often intertwined complexities faced by your business, your family and you. Our goals-based approach relies on close collaboration to deliver customized, comprehensive resolutions to the issues that keep you awake at night. We stand ready to guide you through issues as varied and important as designing and implementing a basic estate plan, to engineering thoughtful and tax-efficient wealth transition strategies, to identifying and adopting complex business transfer techniques. We are especially proud of the positive results that can be achieved when coordinating business transition strategies with a well-designed estate plan. Calfee lawyers are also experienced in helping families navigate their way through the controversies that may erupt when the pressures of wealth management lead to discord among family members. We remain committed to helping individuals and families achieve the peace of mind that can only result from careful attention to detail and thoughtful adherence to the unique mission and values developed over the years by each of our client families. Calfee's Estate and Succession Planning and Administration group is ranked as a "Leading Law Firm" in Private Wealth Law (Ohio) the Chambers High Net Worth Guide 2018. Chambers HNW is the only independent directory specifically aimed at the private wealth market that ranks law firms according to their private client disciplines. 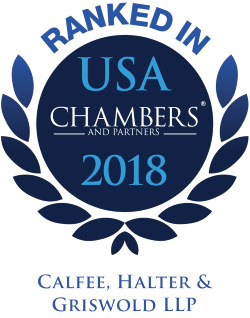 Calfee was selected for inclusion in Trusts and Estates Law as a "Best Law Firm" by U.S.News–Best Lawyers in America 2018 (Metropolitan Tier 1 Cleveland).